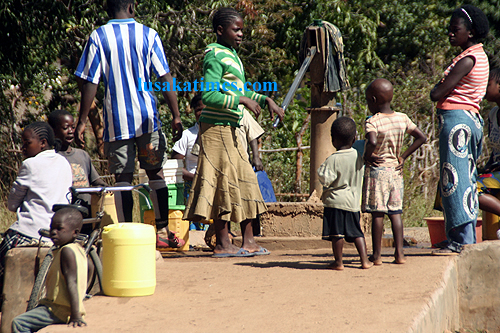 File:Some residents of Chinyunyu drawing water from a hand drawn pump in Chinyunyu. This is one of the few sources of clean and adequate water for the rural area, which is about 70 kilometres from Lusaka. Lusaka Water and Sewerage Company Managing Director Jonathan Kampata says his company remains resolute to increase water supply in the city. Mr. Kampata said the demand for water in Lusaka stands at 411,000 cubic metres per day but his company only supplies 250,000 cubic metres per day.He stated that the ongoing rehabilitation and expansion works of the water plant in Kafue will help cushion the deficit. The Managing Director said this at the Steward Park water reservoir site in Lusaka during a tour of different water sites by a parliamentary committee on Energy, Water and Tourism. Mr. Kampata also bemoaned the encroachment into the company’s reservoirs by some Lusaka residents. “We are finding it difficult to carry out rehabilitation and expansion works due to massive encroachments. Other people put up plots and other structures on our sites,” he said. And Parliamentary Committee Chairperson Ephraim Mbelemu asked what the company is doing to curtail the encroachments. In response, Mr. Kampata said his company is working with Lusaka City Council to carry out inspections as well as demolish structures built on the company property. HOW WOULD ZAMBIA ACHIEVE THE UNIVERSAL ACCESS TO SAFE DRINKING WATER ,……??? Hw can they behave like that???? Water in Rhodes Park is a problem and people are resorting to boreholes. Iam UPSET with this poor MANAGEMENT of water Company!!!! HOW CAN ZAMBIA ACHIEVE THE UNIVERSAL ACCESS TO SAFE DRINKING WATER…??? One week now and no water supply in woodlands/chilenje!! Kampata what are you up to? Encroachments, encroachments, encroachments everywhere as if there’s no government in place. Ba PF please be warned that when ‘Kashimba Chimbwili’ becomes a popular elected President in 2021 don’t say we never warned you; kuya bebele, back to Lilongwe in Nyasaland. Chishimba Kambwili is a congolese. I was his parents neighbours in Luanshya when they were working for the mines. They moved from Congo to now Northern Zambia before coming to the cooperbelt to look for work. be careful what you wish for as evidence is there. What surprises me is how a country with so much water fails to supply its citizens with water. South Africa is a dry country but the majority of the residents in a dry city like Johannesburg have access to water that is ‘imported’ from Lesotho. Lusaka has been growing but the infrastructural capacity has been outstripped by the growth in population and human settlements. It is precisely we there are cholera outbreaks every year. Residents don’t have access to clean water.